spoonboy: Ok, I've registered on the web site. 1. 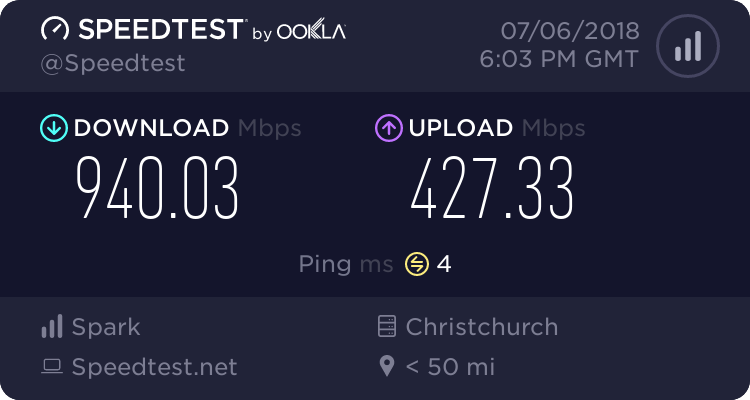 I'm currently on ADSL2+ with TNZ using TG582n model. Will it be possible to use the same modem with BigPipe (I'm not sure if it's locked to be used with Telecom only)? 2. I'm in Wellington City, but my address is not covered by TNZ VDSL. I presume this is because I have a direct line to exchange and apparently Telecom doesn't provide VDSL for such cases. So, is there a chance to get VDSL from you? 2) If you can't get VDSL with Telecom, then you almost certainly can't get it with anybody at all. All ISPs use the same VDSL equipment provided by Chorus. PM me your address and I can take a look, but it's very likely you can't get VDSL. All ISPs use the same VDSL equipment provided by Chorus. That's something that I could never understand. What stops ISPs from buying UCLL and terminating it in their own VDSL port? And if you go back a few years, lots of ISPs were talking about doing exactly that. Main issue for them is that unbundling a cabinet with VDSL is very uneconomic, so they don't bother, and just buy VDSL from Chorus instead for customers on FTTN connections. I believe Telstraclear did put VDSL in lots (all?) of their exchanges, but I think they only sold it to business connections. I believe VF are just using Chorus VDSL, even at exchanges, rather than the stuff they inherited from TCL. Not exactly sure why. Maybe it's just simpler to do that rather than have a mix. Thank you bigpipe for inviting me to trial your VDSL! And big thanks to your technical support for going the extra mile to make a exception for me, it's great to see that even though you're already giving away your lines to testers, you are still happy to go out there further for people. Simply amazing service so far from a customer service point of view, keep it up! HiTM4N: Thank you bigpipe for inviting me to trial your VDSL! Glad to hear. Let us know how it all goes. Awaiting BigPipe connection scheduled this afternoon (fingers crossed!). Just one thing is the switch to VoIP and naked BB at the same time can get a bit tricky. I'd love to see you guys partner with (or resell?) 2Talk VoIP just as an option (and clearly state it is a separate company etc), purely for the convenience of having one point of contact for completing the connection AND landline number port from POTS + DSL to Naked DSL + VoIP. If not, then at least expand your FAQ section regarding VoIP to explain the absolute "best" process (ask a VoIP company + Chorus if need be) to switch to VoIP from an existing POTS or POTS+DSL service. Listing some "Big Pipe approved" install techs on the site would be helpful, and perhaps an official DIY guide if that is possible? kieran21: Awaiting BigPipe connection scheduled this afternoon (fingers crossed!). Just one thing is the switch to VoIP and naked BB at the same time can get a bit tricky. I'd love to see you guys partner with (or resell?) 2Talk VoIP just as an option (and clearly state it is a separate company etc), purely for the convenience of having one point of contact for completing the connection AND landline number port from POTS + DSL to Naked DSL + VoIP. thanks for the feedback. We're definitely looking into all that. Not sure yet about reselling VOIP, but we we're adding a whole bunch of stuff to our FAQ and troubleshooting in the next few weeks, including what you describe. I know coffeebaron is awesome, but he only does north of north island, so we would need some techs for the rest of the country who we can refer to confident they will do a good job. Just waiting to hear back from support person on chorus date. Also waiting to hear if you guys need any of my details, didn't complete trial confirmation form as I'm not cancelling my old line. Just checked in our CRM. Looks like we emailed you a few mins after you posted this. And looks like you have now filled out the form to get the sign-up going properly? If we submit the order to Chorus today, they will probably give us the date tomorrow. It will likely be in the next 3-4 days. spoonboy: I'm using Chrome with AdBlock pluging and Firefox with ABP. Both are showing an empty page. Both are blocking web content on the main page. I just tried out the different filters. It's definitely the privacy one causing the problem. possibly something to do with google analytics. I've forwarded it to our devs to take a look. Just another update on this. We have a fix worked out for the adblock issue (it was to do with google analytics) which we are doing full testing on now. We're only sending out invites for how many sign-ups we can handle, but yes, lots of registrations of interest. I moved from Telecom 150GB plan two days ago and I'm very impressed with how easy and quick the process was. I was preparing myself to spend at least a day without internet talking with helpdesk and trying to configure the modem. Actually, I had to do nothing. I mean, absolutely nothing. I haven't even had to reboot the modem. When I was emailed by Bigpipe that the transfer is completed I wasn't even sure that it's been really transferred so I went to internet to check the external ip and it was changed. Phone stopped working as expected but I don't use it so I had to actually connect it to the line to make sure. My telecom tg582n modem works perfectly with Bigpipe. Speedtest shows the same speed I used to have with Telecom. I tried to download torrents in a peak time and it was always on a max speed. So, I feel almost no difference from Telecom broadband service. Really impressive. The only thing that I've noticed that utorrent shows an orange warning sign frequently that means 'no incomming connections'. Sometimes it's green but not every time. I have utorrent configured to connect on a random port and after restarting it may become green again or vice versa. I presume it may have something to do with the provider's NAT configuration. Anyway, I don't care too much about seeding as long as I can download my stuff. Speedtest recognises that the IP belongs to Telecom. As well, I could be wrong, but I think that with Telecom I could see my external internet address in the modem settings as a gateway or something like this. Now, I can see there some address that starts with 100 and it's different from what whatismyip is showing. So I presume that there is another NAT on the provider's side. But again, I'm not 100% sure that Telecom was different. I think it would be nice to have a static IP address option, even IP6 would be probably alright. One reason is that I'd like to be able connect to my PC wth ssh from outside. Request from whom? And how much will it cost?